Mag-Knight Metal Cutting: Using our CNC Plasma cutter, we can cut Steel, Aluminum, Stainless, Copper or Brass. What cannot be readily die cut by a steel rule die can often be processed by our Plasma Cutting machinery. Like our die cutting service, quantities from 1 to 2 to full production are easily handled. 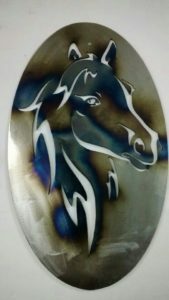 We will take your design or CAD file and Plasma Cut it out of your metal of choice. Single pieces as large as 24″ x 48″ can be cut at one time. Depending on the material and thickness, parts can be cut to within +/- .015″. 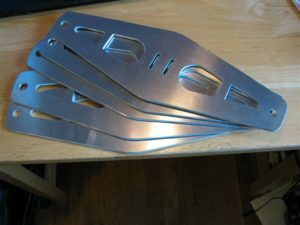 Prototyping prior to production is an ideal application for plasma cutting. Dimensional and geometric changes can be made and new parts cut with minimal effort and expense. Precision Shapes and designs can be accomplished with our CNC cutter. Plasma cutting metal is the least expensive way to cut various metals with minimal losses in precision compared to Laser or Milling. For a demo, take a look at our videos on the sidebar. There you will see how fast and accurate we can cut 1/4″ steel at 30″ per minute (1/2″ per second). 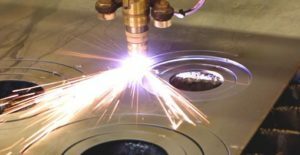 Custom Plasma Cutting Service Materials: See our materials section for preliminary recommendations on die, laser or plasma cutting. Each process has its advantages over the other. Our engineers will choose the most efficient process for your project. Besides precision parts we also cut metal art. Many interesting colors come out of metals when cut using this method. Mag-Knight Die-cut.net | Powered by Mantra & WordPress.